Editor’s note: Ambassador Johnnie Carson is special advisor to the president of the U.S. Institute of Peace. He was assistant secretary of state for African affairs from May 2009 to March 2013 and has also served as ambassador to a number of African nations. The views expressed are his own. As President Barack Obama wraps up his six-day, three nation trip to Africa, much of America’s traveling press will be packing up to leave, too. Let’s hope that the media take home with them a more nuanced view of the continent – and how the United States has a genuine opportunity to improve its standing across the continent and reaffirm its longstanding historical, cultural and political ties to Africa. Africa is changing rapidly, but much of the way Americans and Europeans view the continent is caught up in old stereotypes. Driven by episodic headlines and the publicity of well-intentioned humanitarian organizations and advocacy groups, many people across the United States and Western Europe believe that Africa is run by dictators, mired in conflict and overwhelmed by poverty, disease and starvation. They point to the conflicts in Somalia, Sudan, Mali and the Democratic Republic of the Congo and then draw unfair conclusions about what is happening on a continent comprised of nearly a billion people, living in 54 countries and occupying a land mass that is three and a half times the size of the continental United States. Yes, conflict, poverty and disease continue to challenge various parts of this large continent, but this is not the whole story and it should not be portrayed as the dominant one. Since the collapse of the Soviet Union, Africa has moved progressively into the democratic column. Numerous African countries have adopted new constitutions, embraced multiparty democracy, established functioning parliaments and independent judiciaries and in some states imposed term limits on their top political leaders. Elections – many of them monitored by American and European organizations – are common place. In the past four years, sitting presidents in Senegal and Zambia have been defeated and replaced by opposition leaders; vice presidents in Malawi, Ghana and Nigeria have assumed power without conflict following the untimely deaths of their presidents; and term limited presidents have won office in Namibia, Tanzania, Benin, Mozambique, South Africa and several other states. And in 2011, Nigeria – Africa's most populous state – held its best multiparty elections in decades. The African Union, the continent's most important regional organization, has now imposed a rigid rule that no president, prime minister or government can take its seat in the organization or participate in deliberations if they have come to power as a result of a military coup d'état or an unconstitutional change of government. With 49 countries in sub-Saharan Africa, there will obviously be some occasional democratic setbacks, but the trend line is positive. Economically, Africa remains the poorest and least developed continent in the world, but most of the macro-economic indicators and projections are looking better. Africa largely avoided the worst effects of the recent global economic downturn. Over the past decade, African economies have grown by more than 5 percent a year, and the IMF is projecting that African economies will expand by close to 6 percent in 2013 and 2014. The Economist recently reported that six out of the 10 fastest growing economies in the world are in sub-Saharan Africa. Africa's new growth spurt is different from previous years, when it was driven by large reserves of oil, gas and an abundance of minerals. Today's growth is being fueled by new developments: rapid urbanization; an educated and expanding middle class; access to and innovative use of digital and wireless technology; economic liberalization and policy reforms; easier access to credit; and greater inward investment in infrastructure and capital development projects. New oil and gas discoveries along the coast of Mozambique and Tanzania and new oil discoveries in the waters off Liberia are also contributing to the continent's growth surge. Africa does face a new threat: the spread of international terrorism and the emergence of radical Islamic groups in Mali, northern Nigeria and pockets of East Africa. But as the arc of stability expands, we sometimes forget how many of Africa's worst conflicts have been resolved and what is being done to mitigate those that are ongoing. Bloody liberation conflicts in Angola, Mozambique, Guinea-Bissau, Namibia, Zimbabwe and South Africa all have been wound down, and all but Guinea-Bissau have escaped a recurring cycle of massive violence. Liberia and Sierra Leone – torn apart by the brutality of Charles Taylor – are now peaceful, multiparty democracies. The long war between Ethiopia and Eritrea has ended; and in Rwanda, a genocidal regime that killed an estimated over 800,000 mostly Tutsis, has been replaced by a stable government that has generated substantial economic progress. The fact that Africa hosts more U.N. peacekeepers than any other continent in the world indicates how conflict continues to exist in parts of the continent. But these are the ones that have been most intractable and difficult to solve. Even Mali – Africa's latest conflict zone – has had an extended history of fighting. As President Obama and his entourage wound their way through Senegal, South Africa and Tanzania – three strong democracies – they highlighted the continent's democratic progress and reiterating the message of his 2009 visit to Ghana: that Africa needs more strong institutions and not strong men, and that democracy, rule of law and good governance not only protect citizens’ rights but also increase the confidence of business leaders and investors. American companies have always been major players in the oil and gas sector and in the sale of aircraft, locomotives, and large generators. 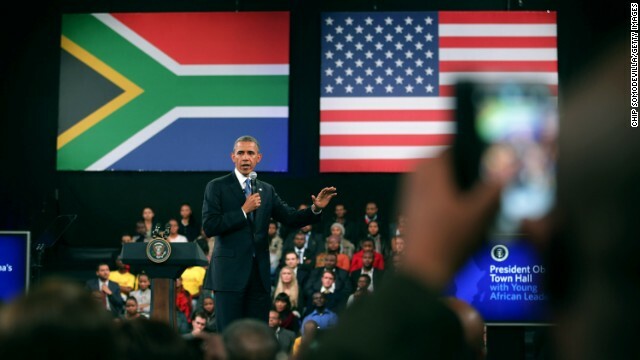 But the Obama administration will try to encourage more American companies to expand their trade and investment interests to energy, agriculture, electronics, telecommunications and industrial projects – not as a counterweight to growing competition from China, Brazil, France or Great Britain, but because it is in our economic interest to be engaged in Africa. As a nation, we have strong economic, political and security interests in Africa. And those interests are likely to grow as Africa's importance grows. Africa is already one of America's most important sources of hydrocarbons. But Africa's new economic and commercial opportunities extend beyond hydrocarbons, and it is important for the U.S. to ramp up its trade and investment activities in Africa. We should not be left behind as Africa's marketplace expands. On the political and security side, we need to forge closer partnerships with Africa to address the common threats – of violent extremism and international terrorism, narco-trafficking, money laundering, trafficking in people, climate change and piracy. As one of the largest and most important voting blocs at the United Nations, and one of the world's great landmasses and ecosystems, Africa cannot be ignored – and its positive engagement as a friend and a partner can and should only be seen as a benefit to the United States. Regarding the Arab Spring: If the United States military had not dislodged Saddam Hussein's powerful and brutal regime, then any large-scale protests (against Assad) would have been impossible. Also, if Saddam Hussein's regime had not been removed, the Arab Spring protests would have made it to Iraq eventually. This would have been a worse situation compared to that of Syria, by several orders of magnitude, because of Iraq's close proximity to Iran and the utter hostility and strength of Hussein's regime. If Saddam Hussein were not removed, I am not sure the Arab Spring would ever have a chance to happen. The removal of Saddam has weaken dictatorship around middle east and eventually made Arab Spring possible. Of course, there are other factors as well. This is very indirect reasoning, but given the timing (and also the comments of the leader of Tunisia), the wikileaks cables played a very important role in kicking off the Arab Spring in Tunisia. No Iraq war, no Bradley Manning dump to wikileaks, no cables. Revolts could still very well happened, but it would have been very different. Pakistan's new Tehreek-I-Insaf party also had a lot to do with wikileaks cables, since they revealed that all parties (including the Islamist supossedly anti American one) were bought and paid for by American bribes. Counterfactual history is complicated. With all due respect to Ambassador Carson, Americam policy towards Africa during the past 5 years has been rather murky, at best. Africans were very hopeful after President Obama was elected, but since then he has been invisible.Meanwhile, America's unreserved support for client states Rwanda and Uganda led in 2012 to a major crisis in the Eastern DRC , with great human suffering. Likewise, the American response to the Salafist invasion of Mali was feeble at best, and I recall Ambassador Carson saying at the time that Mali was not that important, if the French had not intervened, Mali would probably have become a Salafist republic. Africans noticed that too. Meanwhile, Chinese have all but locked up the key import and export markets. Bottom line is that Obama administration has been invisible in Africa, and Africans are looking elsewhere for partners. The author insisted on forging relations with Africa. Yes, it's a good idea, but it's a continent that has the largest number of nations on earth – 54 different countries, more than the number in Asia. Africa is so diverse with different climate zones and types of landscapes, cultural, ethnic and historic backgrounds, people speaking about 1.500 languages. The US has to deal with every single nation differently. With some the relations are good, with others less so. This guy is delusional. The majority of countries in africa are rife with child soldiers, mutilations, enslavement and mistreatment of women. Any 'country' that is remotely stable or not war torn is because the dominant tribe has killed all it's ancient foes. Pluralism doesnt exist is Africa, genocide does. Africa consumes itself and reamains 100's of years behind because thats it nature. Yes! only "Time will Tell". All enemy's[the western countries & his alliance, and other traitors or betrayers] of AFRICA 'll be at shame in the end of Time. AFRICA IS BLESS with all natural characteristic, whether they like it or not AFRICA 'll Rise says the GOD of Creation. AFRICA Time 'll surely Come, cos hundred thousand million years in the eyes mankind is many years, but in the EYES OF THE ALMIGHTY CREATOR is just a twinkle or blink[gleam] Mnwhile AFRICANS Future Destiny is Victories,Prosperity & being bless with all Good qualities; good Government, health-care, Education, job-opportunity, freedom, liberty & right. Also especially LOVE PEACE and UNITY. So shall It BE!!!...... Amen!!! Wil stsrt crying but , there will a judgement for all of as one day.peace be on africa. Obama is behaving like there is no God, but the dsy that he will decend on man there we shall no our faith.shame on man. The rate of consumption of energy in the African/middle east countries that are experiencing "turmoil" has surpassed the rate of resource exploitation. This explains recent events. That is the REAL NEWS. Please comment, rate, and pin.